Lisa Freeman rescued her first dog over thirteen years ago. That dog changed her path in life, healed her, her entire family, and many others. Since then she has continuted to rescue dogs and people. Dog adoption has been part of the Freeman family for years. This spring, after learning about a homeless pup living on the streets, Lisa and husband, John did a puppy rescue and adopted Precious (pictured above) as their very own. Today, Precious is being trained for therapy dog and service dog work. Rescues just need a home where they can be accepted, loved, and trained. Rescuing is seldom easy, but it's always rewarding. Just one week after Precious was adopted into the Freeman's home, something wonderful took place, Lover (her 4 pound Yorkie) and Precious were engaged in a very hilarious and playful game of tug o war. "That's when I saw how gentle this very big dog was," Lisa says. "She just stood still while Lover tugged and growled. Then when he gave up and let go, she carried the toy away." 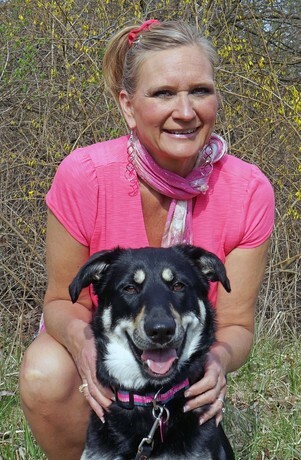 Over the years Lisa has rescued numerous animals, trained them, and placed them in forever homes. Through her interactive blog, she hopes to use that and her facebook page as a resource to help others adopt shelter animals before they are euthanized. She is currently working with an animal rescue shelter that saves puppies and dogs from kill shelters. Before you buy a dog from a breeder, please consider saving a dog's life.